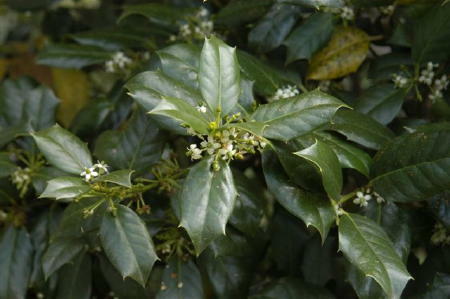 HABIT: Insignificant white flowers in spring, large, showy red berries in fall and winter. Large, dark green leaves. CULTURE: Extremely durable. More compact and healthy in full sun but can tolerate fairly heavy shade. Tolerates severe weather conditions. USES: Screen or specimen plant. Can be trimmed into ornamental tree. Good in containers. PROBLEMS: One of the most durable plants available. 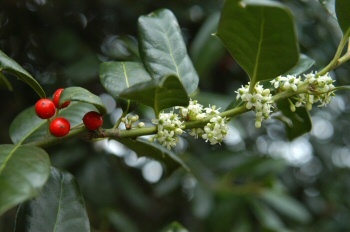 NOTES: 'Nellie R. Stevens' is a cross between Ilex aquifolium, English holly, and Ilex cornuta, Chinese holly. 'Mary Nell' holly is a similar large growing holly with serrated leaves.